PC Gamer got an early look at Digital Storm’s Aventum 3 PC earlier this year, and now the company has said that it is finally ready to ship them out. It’s a hulking metal beast (although slightly more compact than the Aventum 2), and has custom liquid cooling and power integrated right into the case. The water cooling block sits behind the motherboard tray, and integrated fluid ports make it slightly easier to upgrade or maintain without taking the whole system apart. In addition, the case has an integrated PCIe power panel, which makes rewiring easier when replacing components and improves airflow. That airflow is improved further by a dual fan configuration and a control board that automatically adjusts fan speeds thanks to temperature probes placed throughout the case. It also has eight pre-wired hard drive/ SSD storage bays. Aesthetically, the Aventum 3 can only be described as “bold,” and it features viewing windows on both sides, letting you see just how nicely the wires slot behind the motherboard. From the front, you also get a great view of its three chunky fluid pipes which are made out of a clear acrylic so you can see the liquid flowing throughout the chassis. Your basic color options are black matte, white matte, speed orange, envy green, lust red, and storm blue. But Digital Storm says that its team "can do virtually any paint finish." Of course, none of this comes cheap. Your lowest price option right now is $4,930, and that doesn’t even come with a multiple GPU setup. For a top of the line machine featuring an Intel Core i7 5960X, 32GB RAM, and 3x SLI Nvidia Titan X 12GB, you’ll be paying $10,496. 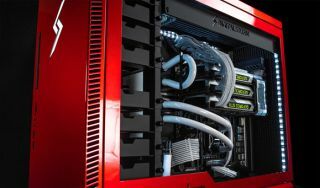 Needless to say, the Aventum 3 is for extreme PC enthusiasts, but it looks like it will please them.